Welcome to Boston Mamas Rock! – where we’re giving a voice to fabulous local mamas, whether they be entrepreneurs, avid volunteers, stay at home moms, moms who have closet talents, authors, media professionals, politicians, professors, etc. Read on for today’s interview with Molly Deschenes, mother of almost two, craft blogger, and think tank/grant writing expert. Then go ahead and nominate yourself or a friend! Christine: Welcome, Molly! You were nominated for this feature given your devotion to mamahood and crafting, but I understand that you also have an interesting professional history so why don’t we start at the beginning? You used to work in foreign policy; what did you do for work and where did your travels take you? Molly: Before I moved back to the Boston area to start a family, I worked primarily for public policy research institutes ("think tanks") and focused on foreign policy issues. I was an International Relations and Spanish major at Tufts University. My first "real" job out of college, after a stint teaching English as a foreign language in Spain, was at a think tank in Washington DC called the American Enterprise Institute. That job brought me to most of the European Union capitals, the Balkans (including some time in Kosovo just after the war), as well as the Middle East. I worked as a staff assistant and was organizing conferences and fact-finding missions in those places of the world. Next, I took a job with an organization called Freedom House and was based in Budapest, Hungary. I managed a grant program that funded think tanks throughout Central and Eastern Europe (CEE). I traveled throughout CEE promoting the grant program and meeting with scholars who were working to help their countries as they dealt with the many social and political issues that come with making a transition from a communist country to a democracy. The most memorable experience from that job was being able to travel to Serbia to meet with grantees just after Slobodan Milo¹eviæ fell from power. My most recent position abroad was as an Executive Director at the Aspen Insitute Berlin. I worked on programming, did some research, and wrote grant proposal to help fund my project. When the NATO summit was in Prague, we were invited by then President Vaclav Havel to organize a parallel conference for luminaries such as Madeleine Albright, who spent many years championing the cause of NATO expansion, but who were no longer working in an official capacity and would not be able to participate in the official summit. It was thrilling to work with foreign policy officials who operated at such a high level. Christine: You eventually decided to settle in the Boston area and change fields; what do you do for work now? Molly: I currently work for a small liberal arts college in the Boston area as a Corporate and Foundations Development Officer. The long and short of it is that I write grant proposals to raise funding to support the college. In most of my previous jobs, I had written several successful grant proposals. When I moved to Boston, I decided to focus on that aspect of my employment experience while looking for a job. I am the product of a strong liberal arts education and believe in the power of a liberal arts approach, so it is nice to work for a cause in which I believe. Christine: You’re also the mom of a toddler son and are expecting #2 this year - congratulations! Where were you were at professionally when you became a mom? How did you handle maternity leave and return to work? Was your work environment supportive of your role as a new mom? Molly: Thanks Christine. We are very excited to become a family of four. When I became a mom almost two years ago, I was in my current position. I took a three-month maternity leave and then returned to work again full time. Typical work weeks in higher education are 35 hours, so it is nice not to have the pressure of a 40 plus hour-a-week job. Also, my commute is only fifteen minutes and my husband works even closer to home, so we are able to pick up our kiddo from daycare and zip back to the house in no time. The transition back to work was both easy and difficult. The easy part was that, once I was in the office, I often found myself thinking, "Wow. This is a lot easier than being at home!" The hard part, of course, was sending my baby off to be cared for by another woman. For me, this blow was softened because our son's daycare provider was recommended to us by a friend and he is now in a wonderful environment. Also, he is in daycare Monday-Thursday and my husband is home with him for most of the day on Fridays. My employer was supportive of my new role as a mother and my direct supervisor, in particular, was fantastic as I made the transition back to work. Christine: I know your son is young, but given your travel experience, how do you feel about traveling with your kids and giving them access to international experiences? Do you have your sights set on a first international adventure? Molly: We have taken our son all over New England as well as a few long weekends in New York city, but we haven't gone international with him yet. However, when the time is right, my husband and I would love to take our children on many trips abroad. There is no better way to understand cultures that are foreign to us than to spend time in other countries. My top choice would be to take a trip to Granada, Spain where I lived just after I graduated from Tufts. It is a magical city and I would be sure to rent a flat in the old neighborhood that looks out on the famous Moorish palace, the Alhambra. Next on the list would be a small island in Croatia called Hvar. Finally, since I haven't been there myself, I would love to travel with my family to any of the countries in Asia. Christine: Let’s move on to your blog, apple cyder, which you started in January 2008. What inspired the blog’s name? And have you found the blog to be an effective platform for keeping in touch with loved ones? Do you have any other expectations of it - fame, fortune, or otherwise? Molly: My husband's grandparents used to run a cyder mill in our mutual hometown and my husband worked at the mill when he was young. Now he presses cyder on a much smaller scale for family and friends in our back yard. It's just a hobby now, but it’s an important part of our family history. Incidentally, my grandfather's family used to own a milk company called Herlihy's Milk, but the blog name apple cyder is much cuter than "milk." I originally started the blog because I was feeling badly about bombarding my family and friends with a million photos of my kid using a format like Shutterfly or Snapfish. I decided that it would be better to post just one or two of the best recent photos and, since I enjoy writing, add a little commentary. Then I incorporated a little show-and-tell of my sewing and craft projects and all of the sudden people outside of my original circle of friends starting reading. The first comment I received from an outsider really surprised me. I thought, "Why on earth would anyone besides my family and friends be interested in this?" I actually don't find the blog to be a super effective platform for staying in touch. I say this because I have many friends who don't use it as a back and forth. Rather, they read it and feel like they don't need to contact me because they already know what I have been up to! Having said that, there are some folks who do say hello and react to blog posts, so it does work both ways. As far as expectations go, I really don't aspire to be the next Heather Bailey. Crafting is fun for me. If I had to do it, I think I would enjoy it a lot less. I've had inquiries about whether I have plans to open an online shop. It’s an interesting idea, but I am a fairly slow crafter and tend to make things a little complicated for myself. It's in my nature. If I tried to sell my creations, I'd have to charge a great deal per item to make it worthwhile. For now, I will stick to torturing my family and friends with handmade gifts! Though I must say, it would be nice to have the hobby that I love become a part of my professional life. A pipe dream would be to open a drop-in crafting studio/lounge like Spark Craft Studios in Porter Square, but that is not something I am pursuing. Christine: Your nominator writes, “Molly posts lovely photos of her gorgeous craft projects, and writes tutorials for the craft-challenged folks like me out there. Reading her blog is always refreshing and inspiring.” What serves as the inspiration for your craft projects? Gift needs? Specific fabrics? Random inspiration? Do you have any formal sewing training? Molly: Most of my creativity springs from the desire to give the perfect gift. I am not sure how often my efforts are met with success, but I love trying. I am also inspired by other craft bloggers as well as my everyday surroundings and experiences. Fabric is another huge source of inspiration. Sometimes I see a certain fabric and know that it will make a beautiful quilt, bag, set of cloth napkins, what have you. Then, I think of a person who I think would appreciate it. Necessity is another important source of inspiration. The night before we went on a recent beach vacation I realized that I couldn't find my son's belt and that our beach bag was in rough shape. I sewed up an over-sized beach bag and two new belts before I went to bed that evening. I think I learned a bit about sewing in a home economics class in high school, but my true mentor is my mother. She is a lifelong sewer and still uses the same machine she had as a teenager. Two of my sisters have also taken on the craft. The best is when we are able to get together on a project, though with my sisters living in Utah and Hawaii, that doesn't happen much these days. Christine: As a designer and avid crafter myself, it truly was a pleasure to troll through your blog to look at your projects; do you have a particular favorite? What is your favorite type of project, and what is an unexplored craft medium you’d love to experiment with? Molly: Thanks! 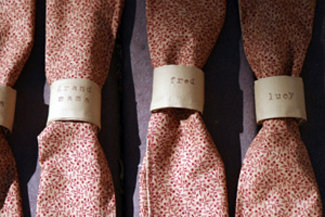 One of my favorite projects is a set of personalized fabric napkin rings with matching napkins that I made for my mom. I like this gift because she chose the fabric, it fits in with the decor of her dining set perfectly and I know it will get lots of use. 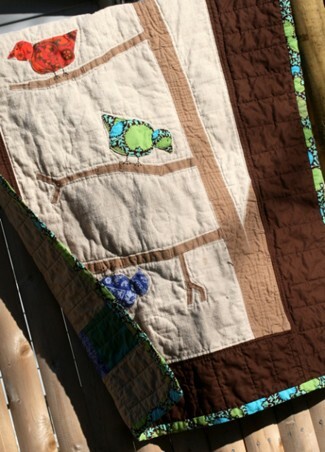 In general, my favorite type of project is quilting. I love choosing fabric combinations and creating something with a particular person in mind. Another favorite project is one that is not on the blog yet. I am making a quilt for my son for his second birthday. I am making it by hand using a method called English paper piecing and will be sewing countless one-inch hexagons together. The plan is to create a modern take on the traditional hexagon quilt. This project is time consuming, but I love that I can carry all of the supplies in my purse and work on it whenever I find myself with a spare fifteen minutes. I can also work on it in the evening in the living room and have a conversation with my husband. 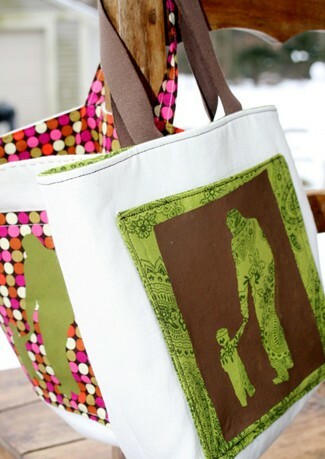 I can't do that when I am using my sewing machine, so it is a very nice change of pace. I adored the big girl quilt that you made for your daughter, by the way. Christine: Where are your favorite places to get supplies, fabrics, etc.? And do you have any favorite craft references for folks who might want to take up crafting but need a little guidance? Molly: This is a difficult question because there are so many places to shop, especially when you factor in the online community. Hands down, my favorite local bricks and mortar shop is Franklin Mill Store in Franklin, MA. They have a great selection of both quilter's cotton and home decor weight fabrics plus all the notions you could ever want. Their home decor fabric remnant table is incredible and they also have a great children's toy section. The sisters that run the store have excellent taste and are very saavy buyers. 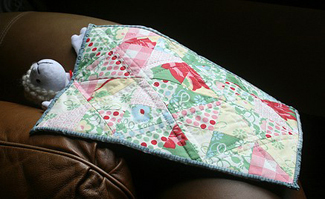 Quilt Home and Sew, Mama, Sew! are two online shops that I really like. And for Japanese prints, I like to shop online at Fabric Tales. I could go on and on about great places to buy fabric, but I will stop at that. If I had to choose just one craft blog to use as a reference, I think it would be Amy Karol's blog called Angry Chicken. She has been blogging for a while so there is a lot of great content in her archives and she is full of excellent ideas. Sew Mama Sew's blog is another go-to spot. As a rule, whenever I am trying to figure out how to do something I have never tried before, I always include the word "blog" in my web search because I find that the crafty blogging community abounds with excellent online tutorials that you can try -- at no cost. Christine: I love to sew but I find that it can be challenging to do so around my very curious daughter, who essentially wants to take over my sewing machine to make tiny handbags for all of her dolls. Where do you fit in your craft time, and do you have dedicated space for it? Molly: I am a nighttime crafter. Nothing much gets created until my son has gone to bed. If I have a deadline, I will work on projects during the day on weekends, but I prefer that my craft time not interfere with the time I spend with my family. I do not have a dedicated space. I pull my supplies out of a closet and work at the dining room table. If I am following on-line tutorial to complete a project, I set up shop next to the computer and work in our office/playroom. I am really not chomping at the bit to have a dedicated space because I like to be able to talk to husband while I work. While it would be nice to be able to leave a project-in-progress out on a table, rather than have to pack it away before it is finished, I think I would feel isolated in a room that was dedicated to crafting. Besides, I wouldn't be able to bore my husband as frequently as I normally do, asking him what he thinks of my silly creations! Molly: My favorite thing about being a Boston mama really has nothing to do with the city of Boston at all. It is great to be close to my family after having spent a good deal of my professional life abroad. It is such a blessing to have all of the grandparents, plus a bunch of aunts and uncles, so present and active in our family life. The support they give us is indispensable. Family aside, I love Boston for its fantastic location. We are a 25-minute drive outside of the city, can zip to the beaches of Cape Cod in the summer, and have easy access to the ski mountains in New Hampshire and Vermont during the winter months.